Heavy-duty metal snaps hold box together and provide strength. 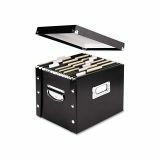 Snap-N-Store Snap N Store Storage Box, Letter, 11 3/4w x 9 3/4d x 9 1/2h, Black - Desktop or archival filing is easy to store. With heavy-duty fiberboard panels and industrial-size snaps, collapsible file box ships and stores flat, and can be assembled in a snap. Features chrome-steel handles for easy carrying, and chrome card holder for labeling. Steel-reinforced top edges are perfect for hanging folders. 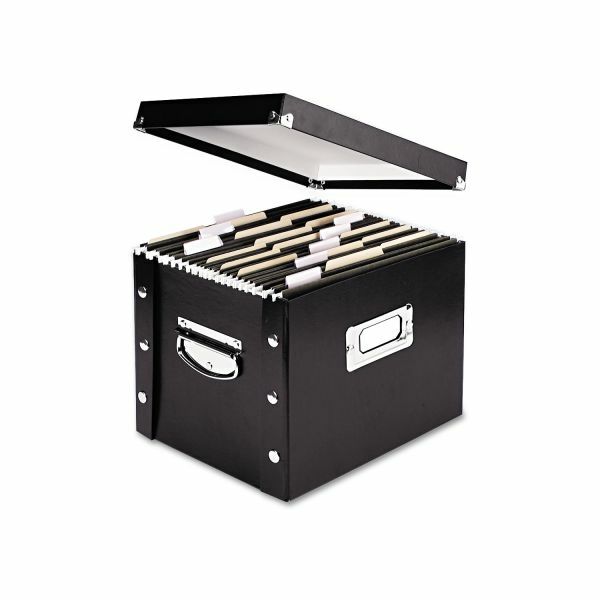 Collapsible file box with glossy laminate accommodates letter-size folders. Contains 65 percent recycled material. Can be disassembled and stored flat.